27 December 2017: A new league table showing the impact of overflowing bins in the UK’s major metropolitan areas reveals that Londoners are hardest hit by the effects of problem waste. The rankings, produced by on-demand rubbish removers Clearabee and research consultancy Opinium, indicate that almost a third (30 per cent) of London’s seven million residents have been adversely affected by excess household rubbish, a far greater proportion than other UK cities. Urban foxes are the biggest problem for Londoners, 14 per cent of whom said they had encountered waste scattered by the carnivorous mammals. Other common complaints associated with overflowing bins in the Capital included foul smells and rats, issues affecting 12 per cent and six per cent of Londoners respectively. Outside of London, people in Leeds, Birmingham and Newcastle also reported problems associated with rubbish at rates that exceeded the national average. 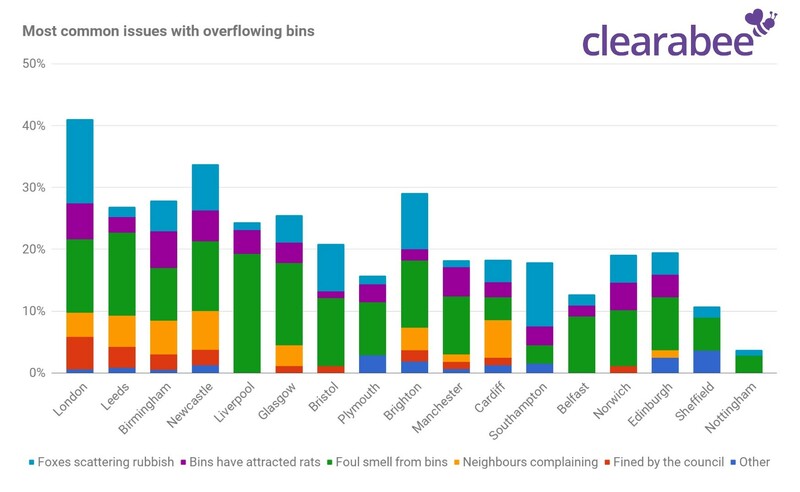 Residents of Sheffield and Nottingham lodged the fewest complaints in the cities covered by Clearabee’s study. Nationwide, one in five (20 per cent) people have experienced problems with overflowing bins, the most common of which (10 per cent) being foul smells. Six per cent of households have had issues with foxes scattering waste and four per cent say excess rubbish has attracted rats to their properties. Problems with waste were more frequent amongst younger adults. Across the UK, 29 per cent of people aged 18-34 had experienced issues, compared to 22 per cent of those aged 35- 54 and just 10 per cent of over 55s. Clearabee has launched a new bag and sack product for the home market. Rolls of bags are sold, with an option to order an on-demand next day collection of 3 bags or more, for a fixed price. The product is targeted at customers who occasionally, or often, exceed the capacity of their wheelie bin and seek a convenient and eco-friendly alternative. Clearabee typically diverts 100% of waste from landfill in London, and 90% across the country – which far exceeds that often achieved by local authorities. As well as standard refuse bags, Clearabee offers rubble sacks which are perfect for small building and garden projects, when one of the larger skip bags may be too big for the job. Clearabee also offers a fully nationwide man and van clearance service.